With recent funding increases, the Department of Energy is advancing a suite of upgrades to its light and neutron source scientific user facilities, helping them remain competitive with European facilities. Meanwhile, there are new discussions about building a new reactor-based neutron source, even as Congress pushes ahead with a different reactor for nuclear energy R&D. 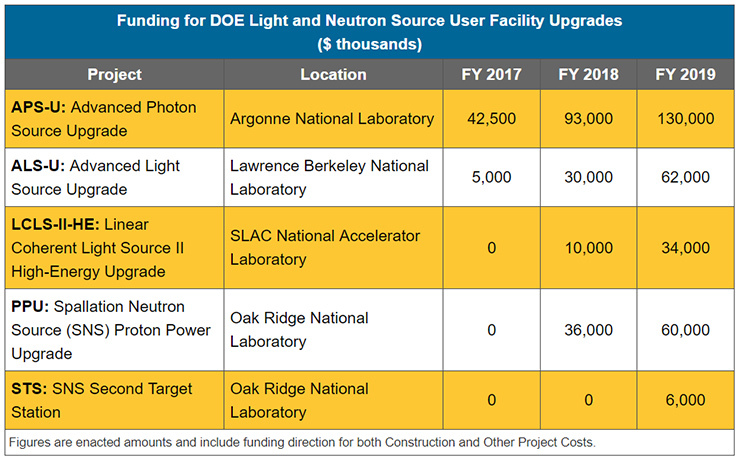 DOE’s light and neutron source user facilities are among the beneficiaries of the increase, with support ramping up for all five projects endorsed by the 2016 Basic Energy Sciences Advisory Committee (BESAC) report on facility upgrades. Currently, the projects are in various stages of planning and advance procurement, with construction awaiting the completion and approval of designs and cost estimates. Combined, the projects are likely to cost on the order of $3 billion to complete. Each year, thousands of researchers working in fields ranging from physics to biomedicine make use of DOE’s light and neutron sources, which also include the National Synchrotron Light Source II (NSLS-II) at Brookhaven National Laboratory, the original LCLS and the Stanford Synchrotron Radiation Light Source at SLAC, and the High Flux Isotope Reactor (HFIR) at Oak Ridge. The facilities provide cutting-edge research capabilities, but scientific progress and international competition create pressure to periodically improve or replace them. The current suite of upgrade projects has been anticipated for some time. Between 2009 and 2011, DOE gave initial approval to STS, APS-U, the LCLS-II facility, and a facility called the Next Generation Light Source. However, all four projects were soon put on ice. According to Pat Dehmer, the Office of Science’s deputy director for science programs at that time, DOE chose to concentrate on building out the capacity of SNS’ first target station and to take a second look at the light source projects before committing to them. A 2013 BESAC report concluded the light source plans were insufficiently ambitious and would “leave the U.S. behind the international community.” The verdict sent LCLS-II and APS-U back to the drawing board and derailed the Next Generation Light Source altogether. The things that were part of our long-term five-year plan for our various labs, those are being brought forward so our lab directors at Stanford and Berkeley are all of a sudden working on things that they were hoping to get money for two, three, four, five years down the road. There is no guarantee Congress will continue to fully fund these projects if there is a shift toward tighter budgets, but a number of lawmakers have conveyed a specific interest in them through pending bipartisan legislation. And there are signs of an appetite for even more construction: in its most recent appropriations law, Congress also asked DOE to prepare a plan for doubling the number of beamlines at NSLS-II. 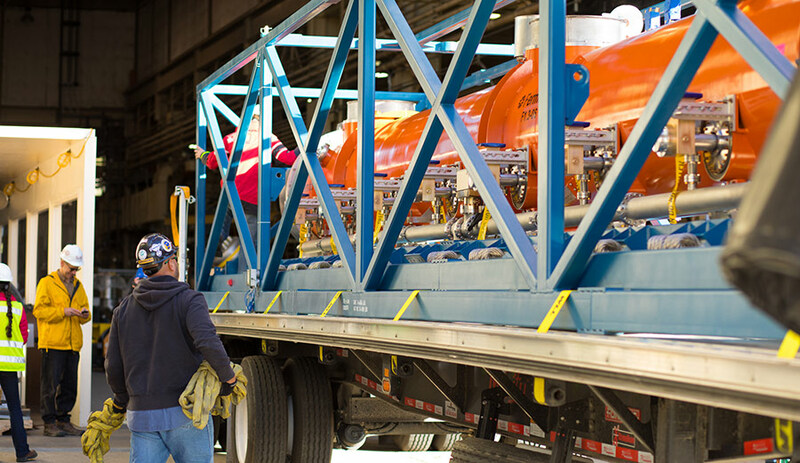 The first cryomodule for the LCLS-II facility was delivered from Fermilab to SLAC National Accelerator Laboratory in January. A planned upgrade will entail the installation of additional cryomodules, enabling the energy of the superconducting accelerator at the core of the facility to be doubled. Whatever happens in the U.S., the international competition spurring on the upgrades at DOE’s light and neutron sources is unlikely to abate. While facilities proposed and under construction in Asia are increasingly comparable to their U.S. counterparts, the strongest and most immediate pressure is coming from Europe. The European X-ray Free Electron Laser (XFEL) in Germany started operations in 2017. LCLS-II, which is also an XFEL, will have a much higher pulse repetition rate but its energy upgrade will still be needed to achieve many of the capabilities that are already available at the European XFEL. Europe’s preeminent synchrotron light source, the European Synchrotron Radiation Facility in France, is currently undergoing a major upgrade called the Extremely Brilliant Source (ESRF-EBS) that is targeted for completion in 2020. The upgrade to APS, the peer facility in the U.S., will bring the brightness of its beams into the same vicinity as those at ESRF-ESB. The Europeans are also beginning to plan for the more distant future of their light sources. One year ago, the operators of Europe-based light source user facilities formally established a consortium called the League of European Accelerator-based Photon Sources (LEAPS). The group’s goal is to promote R&D on light source-related technologies and improve coordination between national and multinational facilities as they plan new projects. Among neutron sources, the current world-leading capabilities of SNS are set to be overtaken once the European Spallation Source in Sweden begins operations, which is currently expected in 2023. At that point, the PPU and STS projects will be needed to help SNS maintain a global leadership position. Aside from the need to update the capabilities of its neutron source facilities, the U.S. is also facing a major shortfall in capacity for the neutron scattering research conducted at those facilities. A recent American Physical Society study outlining the problem observed that U.S. user facilities host 48 neutron scattering and imaging instruments compared to 153 in Europe. That shortfall is felt at facilities such as SNS, which is “hugely oversubscribed,” according to Paul Langan, who heads the neutron science program at Oak Ridge. He told FYI the PPU project will increase SNS’ neutron flux, which will help alleviate the situation. In the longer term, STS is expected to host 22 new instruments as well as provide capabilities not available at the first target station. Of the light and neutron source projects the Office of Science is currently pursuing, STS is the most ambitious by a wide margin: Congress anticipates it will cost about $1.5 billion. 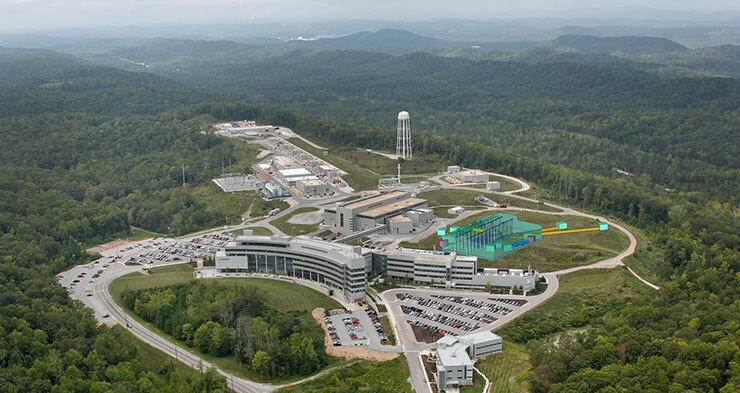 A rendering of the Spallation Neutron Source's planned Second Target Station is overlaid on a photo of the existing facility. Even with the investments at SNS, though, there will still be capacity gaps. The American Physical Society study focuses on needs relating to research reactors, which provide capabilities complementary to those at spallation sources. Currently, aside from HFIR, an 85 megawatt facility, the U.S. government supports one other reactor for neutron scattering experiments, a facility at the National Institute of Standards and Technology in Maryland that operates at 20 megawatts. Both facilities are more than 50 years old and functioning well. The study recommends the U.S. add to existing capacity by developing a “new generation” of research reactor that uses low enriched uranium fuel, avoiding the nuclear weapons proliferation risk posed by the highly enriched uranium used in existing reactors. The study’s co-chairs, University of Michigan physicist James Wells and retired Sandia National Laboratories physicist Julia Phillips, told FYI they anticipate the project would entail establishing a major new user facility. Given that planning for such a reactor is less advanced than for STS, and that it would have to clear significant regulatory hurdles, they said it is probably a prospect for the longer term. The U.S. government has not advanced a proposal to build a new reactor-based neutron scattering facility since plans for a 330 megawatt reactor called the Advanced Neutron Source fell through in the mid-1990s. At this month’s meeting of NIST’s primary advisory committee, though, NIST Director Walter Copan reported that DOE, the National Science Foundation, and the National Academies are interested in working with NIST on “the next phase of a national study of what needs to be done” with respect to a new reactor. Congress, meanwhile, is currently pushing a different reactor-based user facility called the Versatile Test Reactor (VTR). That facility would test materials and fuels intended for use in certain new types of power-generating reactors by irradiating them with high-energy neutrons. Its cost is uncertain but its backers in Congress propose to spend about $2 billion on it. Some members of the nuclear science and engineering community suspect the reactor could be more expensive and are skeptical of its value. Lawmakers, though, believe it will help keep the U.S. nuclear industry competitive in the long run. Last month, President Trump signed bipartisan legislation directing the DOE Office of Nuclear Energy to proceed with the facility if it formally affirms the need for it. Congress also provided $65 million for preliminary R&D in its fiscal year 2019 appropriations. John Wagner, who heads the Nuclear Science and Technology Directorate at Idaho National Laboratory, recently told the House Science Committee that DOE plans to evaluate the need for VTR early next year and INL will soon issue a contract to further develop the VTR concept and an associated cost estimate. He said DOE is aiming to finish work on the reactor by October 2026.